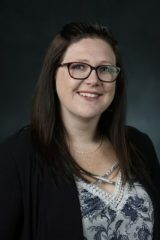 Nicole Ashpole received her Bachelor of Arts in Biology from Concordia College, Moorhead MN in 2007 and her Ph.D. in Medical Neuroscience under the supervision of Andy Hudmon from Indiana University School of Medicine in 2012. Her graduate research focused on the understanding how changes in a key intracellular kinase signaling cascade, CaMKII, influenced the viability and function of neurons and astrocytes. Nicole went on to do her postdoctoral research in the laboratory of William Sonntag, at the Reynolds Oklahoma Center on Aging within the University of Oklahoma Health Sciences Center. There, she focused on examining how age-related changes in endocrine signaling affected the lifespan and healthspan of mice, with a special emphasis on how the loss of growth hormone and IGF-1 influenced learning and memory. Nicole began her independent research career the summer of 2016 at the University of Mississippi School of Pharmacy in the Department of BioMolecular Sciences as an Assistant Professor of Pharmacology and a Research Assistant Professor in the Research Institute of Pharmaceutical Sciences. One of the most debilitating aspects of advanced age is the accompanying cognitive decline. Patients that experience cognitive deficits are faced with the loss of independence, decreased healthspan, and increased financial burden. Studies suggest that age-related cognitive decline is potentially reversible, but the underlying mechanistic changes have yet to be fully elucidated. My research program focuses on identifying how reduced neuroendocrine signaling impacts the function of neurons, astrocytes, and the supporting vasculature in the aging brain. Using genetic and pharmacological tools, we are able to manipulate growth hormone and IGF-1 signaling within these cells and examine how learning and memory is affected. We then examine the ensuing structural, biochemical, and genetic changes within the brain to understand which signaling cascades are contributing to the observed alterations in learning and memory. We are particularly interested in identifying which kinase signaling cascades are altered by the loss of these endocrine signals in advanced age. By characterizing these changes, we hope to uncover pharmacological targets that may delay or avert the onset of age-related cognitive decline. 20. Ashpole NM, Herron JC, Estep PN, Logan S, Hodges EL, Yabluchanskiy A, Humphrey MB, Sonntag WE (2016). Differential effects of IGF-1 deficiency during the lifespan on structural and biomechanical properties in the tibia of aged mice. Accepted March 3rd, 2016. 18. Toth P, Tarantini S, Ashpole NM, Tucsek Z, Milne GL, Valcarcel-Ares NM, Menyhart A, Farkas E, Sonntag WE, Csiszar A, Ungvari Z (2015) IGF-1 deficiency impairs neurovascular coupling in mice: implications for cerebomicrovascular aging. Aging Cell. Epub July 14. 17. Le WH, Xu X, Ashpole NM, Hudmon A, Kulkarni PM, Thakur GH, Lai YY, Hohmann AG. (2015) Small molecule inhibitors of PSD-95-nNOS protein-protein interactions as novel analgesics. Neuropharmacology. Epub Jun 10. 16. Springo Z, Toth P, Tarantini S, Ashpole NM, Tucsek Z, Sonntag WE, Csiszar A, Koller A, Ungvari ZI. (2015) Aging impairs myogenic adaptation to pulsatile contractility in mouse cerebral arteries. Journal of Cerebral Blood Flow and Metabolism. March 31: 35(4):527-30. 15. Ashpole NM, Sanders JE, Hodges EL, Yan H, Sonntag WE (2014). Growth hormone, insulin-like growth factor-1 and the aging brain. Experimental Gerontology. Aug: 68:76-81. 14. Yan H, Mitschelen M, Toth P, Ashpole NM, Farley JA, Hodges EL, Warrington JP, Han S, Fung KM, Csiszar A, Ungvari Z, Sonntag WE (2014). Endothelin-1-induced focal cerebral ischemia in Growth Hormone/IGF-1 deficient Lewis Dwarf Rat. Journal of Gerontology: Biological Sciences and Medical Sciences Nov;69(11):1353-62. 13. Ashpole NM, Warrington JP, Mitschelen MC, Yan H, Sosnowska D, Gautam T, Farley JA, Csiszar A, Ungvari ZI, Sonntag WE (2014). Systemic influences contribute to prolonged vascular rarefaction following brain irradiation: a role for endothelial progenitor cells. American Journal of Physiology – Heart and Circulatory Physiology, Sep 15;307(6):H858-68. 12. Toth P, Tarantini S, Tucsek Z, Ashpole NM, Sosnowska D, Guatam T, Ballabh P, Koller A, Sonntag WE, Csiszar A, Unvgari Z (2014). Resveratrol treatment rescues neurovascular coupling in aged mice:role of improved cerebromicrovascular endothelial function and down-regulation of NADPH oxidase. American Journal of Physiology – Heart and Circulatory Physiology, 306(3):H299-308. 11. Warrington JP, Ashpole NM, Csiszar A, Lee YW, Ungvari Z, Sonntag WE. (2013). Whole brain radiation-induced vascular cognitive impairment: mechanisms and implications. Journal of Vascular Research, 50(6):445-457. 10. Sonntag WE, Deak F, Ashpole NM, Toth P, Csiszar A, Freeman W, Ungvari Z. (2013) Insulin-like growth factor-1 in CNS and cerebrovascular aging. Frontiers in Aging Neuroscience,5:27. 9. Ashpole NM, Chawla AR, Martin MP, Brustovetsky T, Brustovetsky N, Hudmon, A. (2013) Loss of calcium/calmodulin-dependent protein kinase II activity in cortical astrocytes decreases glutamate uptake and induces neurotoxic release of ATP. Journal of Biological Chemistry, 288(20):14599-611. 8. Song W, Xiao Y, Chen H, Ashpole NM, Piekarz AD, Ma P, Hudmon A, Cummins TR, and Shou W. (2012) The human Nav1.5 F1486 deletion associated with Long QT Syndrome leads to impaired sodium channel inactivation and reduced Lidocaine sensitivity. Journal of Physiology, 590(Pt 20):5123-39. 7. Ashpole NM*, Herren A*, Ginsburg K, Brogan J, Johnson D, Cummins T, Bers D, and Hudmon A. (2012). Mechanisms underlying Ca2+/calmodulin-dependent protein kinase II (CaMKII) regulation of cardiac sodium channel Nav1.5 gating. Journal of Biological Chemistry 287(24):19856-69. 6. Ashpole NM, Song W, Brustovetsky T, Engelman E, Brustovetsky N, Cummins T, Hudmon A. (2012) Calcium/calmodulin-dependent protein kinase II (CaMKII) inhibition induces neurotoxicity via dysregulation of glutamate/calcium signaling and hyperexcitability. Journal of Biological Chemistry, 287(11):8495-506. 5. Brittain J, Chen L, Broustovetsky T, Gao X, Ashpole NM, Wilson S, Hudmon A, White F, Brustovetsky N, Chen J, Khanna R. (2011). Neuroprotection against traumatic brain injury by a peptide derived from the collapsin response mediator protein 2 (CRMP-2). Journal of Biological Chemistry. Oct 28;286(43):37778-92. 4. Coultrap S, Vest R, Ashpole NM, Hudmon A, and Bayer KU. (2011). CaMKII and cerebral ischemia. Acta Pharmacologica Sinica, 32 (7):861-72. 3. Brittain J, Duarte D, Wilson S, Zhu W, Ballard C, Johnson P, Liu N, Xiong W, Ripsch M, Wang Y, Fehrenbacher J, Fitz S, Khanna M, Park C, Schmutzler B, Cheon B, Due M, Brustovetsky T, Ashpole NM, Hudmon A, Meroueh S, Hingtgen C, Brustovetsky N, Ji R, Hurley J, Jin X, Shekhar A, Xu XM, Oxford G, Vasko M, White F, Khanna R. (2011). Suppression of inflammatory and neuropathic pain by uncoupling CRMP-2 from the presynaptic Ca2+ channel complex. Nature Medicine, 17(7):822-9. 2. Li L, Khanna M, Jo I, Wang F, Ashpole NM, Hudmon A, and Meroueh S. (2011). Target-specific support vector machine scoring in structure-based virtual screening: computational validation, in vitro testing in kinases, and effects on lung cancer cell proliferation. Journal of Chemical Information and Modeling, 51(4):755-9. 1. Ashpole NM and Hudmon A. (2011). Excitotoxic neuroprotection and vulnerability with CaMKII inhibition. Molecular and Cellular Neuroscience, 46(4):720-30.